One of the most Catholic countries in the World, the Maltese Islands consist of several islands, only three of which are inhabited: Malta, Gozo and Comine. Malta is the principal of the three and the one most visited. With an overwhelming Catholic population, there are many beautiful churches in Malta. Malta is the site of the shipwreck of Saint Paul, recorded in the Acts of the Apostles Chapter 27: 1-44. Paul, being a Roman citizen, had the right to be tried in Rome and so was on his way when the ship he was on was shipwrecked and they ended up in Malta. The Bible goes on to describe his stay here: how he spent three months on the island and how he cured the father of Publius, Rome’s main ruler on the island, of a serious fever and dysentery. Then many other people came to Paul and he laid hands on them and they were cured. Tradition tells that Publius converted to Christianity and was made the first Bishop of Malta. The Cathedral of Mdina is said to stand on the site of Publius’ house. The Church is almost tucked away on a side street with an entrance that belies the beauty of its interior. Once inside the ornate decorations and statues are quite a surprise to most. Among its treasures are a wrist bone of Saint Paul and the pillar on which he was beheaded in Rome. Perhaps the most important event is the Feast Day of Saint Paul’s Shipwreck, celebrated on February 10th each year. 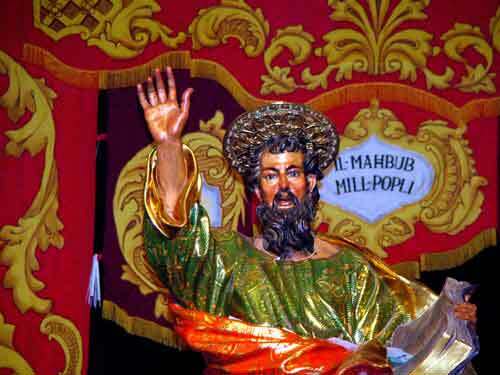 A wooden statue of Saint Paul, carved in 1657 by Melchior Gafa, is taken from the Church and paraded through the town. A small donation is asked to help in the maintenance but there is no entrance fee. If you happen to be in Malta, don’t miss it! There is an international airport on the main island of Malta and there is also regular ferry service from mainland Italy. Malta is a port of call on Mediterranean cruises from lines including Royal Caribbean, MSC, Celebrity, Azamara, Regent Seven Seas and SilverSea. Most of these spend a full day in Malta. There is no official website for the church.